reliable sources state that Ontario PC candidate Ali Chahbar – who has claimed to have been a life-long conservative, but who has admitted being a card-carrying federal Liberal – is not now and has never been a member of the Conservative Party of Canada. Ali Chahbar has made it his habit to point out to voters that he is married to London lawyer Rasha El-Tawil, but voters have expressed concern to me nobody has told the voting public that Ms El-Tawil is the same Rasha El-Tawil who was president of the anti-Israeli campus group Solidarity for Palestinian Human Rights while she was at the University of Western Ontario. There is concern that the voting public is not being told that, in that capacity, Ms El-Tawil and her group erected an offensive anti-Israeli “apartheid wall” at the university’s student centre in November of 2004, for which stunt the group lost its status with the university. The wall was intended to be an “effigy” of the wall erected in Israel to protect Israelis from ongoing attacks by neighbouring radicals whose mission it is to end Israel’s existence. Ms El-Tawil and her group consistently have identified Israel not only as “oppressors” of Palestinians, but have accused Israel of engaging in “genocide”. I receive a lot of political ‘insider’ information in my role as a political party leader. Most of the time, I take it with a grain of salt, or trust it but regard it as a distraction from the important issues facing Ontario. However, in the last few hours, I have received credible, but disturbing information concerning one candidate in the London West Ontario provincial by-election. And, given that the main concern of voters in Ontario’s by-elections is essentially one of being able to trust the honesty and integrity of the candidates, it would be irresponsible of me not to disclose to the public the disconcerting information that concerned Londoners have shared with me about Ontario Progressive Conservative (PC) candidate Ali Chahbar. The disturbing revelations are manifold, but fall into two main categories, both dealing with the issue of whether Mr. Chahbar’s political interests are what he wants us all to believe they are. The first category concerns new information relating to whether or not Mr. Chahbar is actually a small-c conservative, or whether he is yet another big-L liberal trying to get into office using the PC party as a flag of convenience. The second, perhaps more anxiety-provoking issue concerns the views of the company Mr. Chahbar keeps so closely – concerning Israel, and the Ontario Jewish community – and whether he credibly can deny sympathy with those views. I have received two pieces of information that suggest Mr. Chahbar’s heart is with the Liberals, not with conservatives. But, before sharing those two pieces, some context – concerning Mr. Chabar’s unwillingness to deal frankly and and unambiguously with his history as a federal Liberal Party member – is necessary. 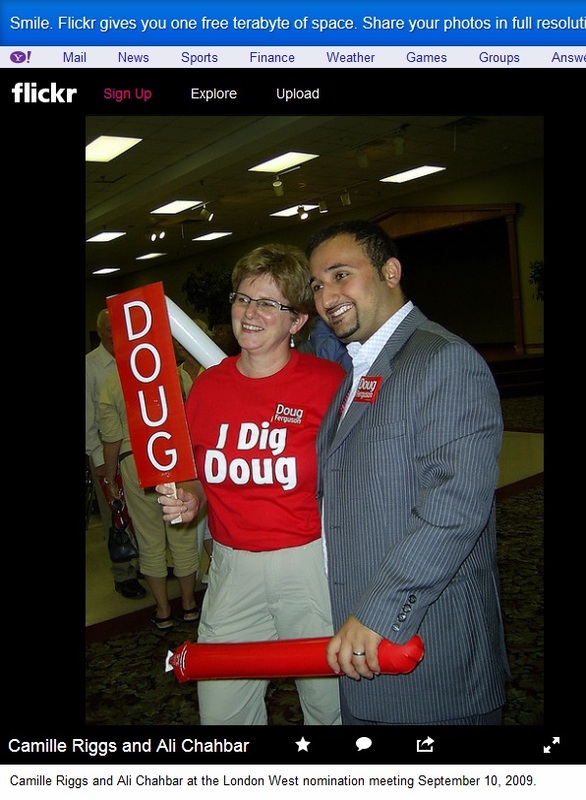 As many in London know, on July 3 – the day that the by-election writ was dropped in Ontario – a photo began circulating on Twitter showing Ontario PC candidate Ali Chahbar donning a federal Liberal button and a red Liberal thunderstick at a September 10, 2009 federal Liberal nomination meeting with former Liberal Party of Canada president and London West federal Liberal candidate Doug Ferguson. The explanation sounded plausible: we were to believe he had merely gone out to the meeting to show support for his boss. It was all “tongue-in-cheek” Reading anything more into it was, he implied, laughable. Sensing a credibility melt-down, Chahbar finally decided to fess-up. Later that afternoon AM690 reported that Chahbar had called them and admitted that, yes, in fact, he had become a member of the Liberal Party. As I say above, I have in recent hours received two additional pieces of information from reliable sources that again bring into question not only his political orientation but – more importantly – the issue of whether or not he is being honest and forthright with the voting public concerning his Liberal affiliation. First, I have received an allegation that Mr. Chahbar – the self-professed life-long Conservative – is not now, and has never been a member of the federal Conservative party. Given that he admits having been a member of the federal Liberal Party, Mr. Chahbar should confirm or deny the report about his non-membership in the federal Conservative Party. If the Conservative party’s database includes no information to the effect that Mr. Chahbar is a Conservative member, local Conservative party members with access to the database can confirm the absence of such a record without violating any privacy concerns. 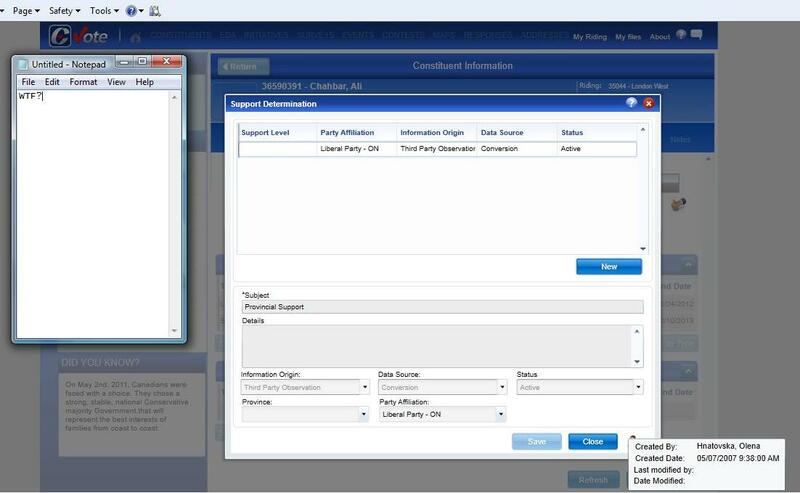 Second, I have received from a credible source a screen capture of someone viewing an entry dated 05/07/2007 on the Conservative Party of Canada’s database (see below). Under the subject “Provincial Support”, it lists an “Ali Chahbar” as having the party affiliation “Liberal Party – Ontario”. To be fair, there may well be more than one Liberal Ali Chahbar who gives “provincial support” to, and is affiliated with, the provincial Ontario Liberal Party. However, given Ontario PC candidate Ali Chahbar’s earlier evasions of the question of his federal Liberal membership, Mr. Chahbar owes the public a clarification as to whether or not he has in any way been a supporter of the Ontario provincial Liberal Party; and if he has any explanation for why an “Ali Chahbar” shows up in the federal Conservative database as being a provincial supporter of the Ontario provincial Liberal Party. A straight answer is owed by Ontario PC candidate Ali Chahbar, in the circumstances, because the context is this: the Ontario Liberals have lost all credibility with the voters, and London West voters ought not to be tricked into voting for another Liberal, under cover of an Ontario PC flag of convenience. In recent days, it has been reported that London’s Aaron Yoon has returned to Canada. Yoon is one of four young men were attended South Collegiate in the riding of London West, two of whom were killed while taking part in an Al Qaeda attack on a gas plant in Algeria last January. Given the timing of his return – and given the Ontario Liberal record in waffling on the issue of adopting Sharia as part of Ontario’s laws in respect of marital dispute resolution – it is important that all candidates in the London West riding make clear their stand on the very thing that those home grown terrorists were fighting for. Specifically, each candidate should be asked: Do you reject Sharia? Do you agree that Sharia should never be permitted to be adopted in Canadian provincial and federal law (neither as a whole, nor in part). And, given the CUPE/NDP arguably anti-Semitic call both for a boycott of trade with Israel, and a boycott on Israeli universities, each candidate should state whether Israel has a right to exist. The most pressing issue facing the Ontario government is its current unwillingness to balance the budget. The most pressing issue for voters is the credibility and honesty of the candidates. However, whether during a by-election or between elections, one cannot take matters such as home-grown terrorism lightly. It is not an insignificant issue, whether or not an election is underway. There are many people in London – of all religions, Muslim included – who reject Sharia theocracy and those who, like the two Londoners involved in the Algerian attack, will stop at nothing to defeat democracy, and replace the laws made by our elected legislators with the laws some say were laid down by Allah. They all deserve and need the security of knowing that, whoever they elect to represent them at Queen’s Park, that MPP will take a strong stand against Shariah and the marginalizing of Jews and Israel. Students, it reported, walked into the campus community center to find “…a display with slogans calling them murderers…”. Ms El-Tawil was quoted in the article as saying that “The wall is a symbolic replica of the apartheid wall, which is being built on occupied Palestinian territories”. “SPHR fully endorses the use of the term genocide as an accurate descriptor of the situation on the ground in the Occupied Palestinian Territories…Israeli-perpetrated genocide is an issue that has been well publicized by numerous internationally renowned and distinguished academics and legal experts…”. The media release concluded: “For more information, please contact: Rasha El-Tawil”. I have have long defended Israel’s right to exist, free from the never-ending missile attacks and suicide bombers that gave rise to the building of a defensive wall by Israel. I have consistently opposed claims that Israel’s self-defence amounts to “genocide”. Such statements – and related leftist efforts like the CUPE/NDP call for a boycott on trade with Israel – are, to my mind, not only defamatory and inflammatory, but also anti-Semitic, and they tend to come from the same quarters who either advocate Sharia law, or who turn a blind eye to the threat it poses to democracy and freedom. “This one-of-a-kind initiative is a celebration of everything “Palestinian.” This oppressed nation living under the occupation deserves to be credited and deserves to be merited; its men and women; its past and future and its dream and aspiration. The commonality between the anti-Israeli messages of Ms El-Tawil’s group, and those of Mr. El-Tawil’s group is striking. That said, El-Tawil may simply be a common name, and there may be no familial relation between Mr. El-Tawil and Ms El-Tawil. Mr. El-Tawil’s profile, on the all4palestine.org website, also states that he was as founding member of a group called the Canada-Palestine Health Research Foundation. Don’t bother looking for a web site for the organization. I found very few mentions of the group on the internet. However, I did find one curious mention. 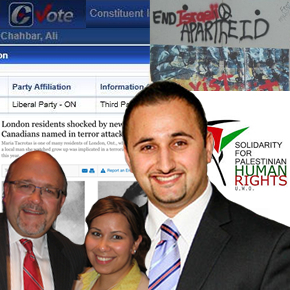 In a June 14, 2010 approved biography of London’s Ab Chahbar – Ontario PC candidate Ali Chahbar’s father – states that he has been a volunteer for the aforementioned Canada-Palestine Health Research Foundation, founded by Mr. El-Tawil. One must be careful always not to jump to conclusions. However, I submit that it is only fair to the voters of London West that Mr. Chahbar give a fulsome answer to his position on Sharia (i.e., does he unequivocally condemn it?). The voters of London West deserve a fulsome answer to related questions: Does Ali Chahbar agree that Sharia should never form even the faintest part of the laws of Canada or Ontario? ; does he condemn the views expressed by his spouse, Rasha El-Tawil in respect of Israel and Palestine? Does he condemn those who regard Israel as “genocidal” or who regard Israel to be engaged in “apartheid”? Given the facts, and given the recent connection of four South Collegiate students, two of whom were involved in the Al Qaeda attack in Algeria, these are fair questions not only for Mr. Chahbar, but for all London West candidates. These questions are questions pertaining not to personal matters, but to matters of public policy. They are not only fair game: they are, especially at this point in time, questions that demand answers.